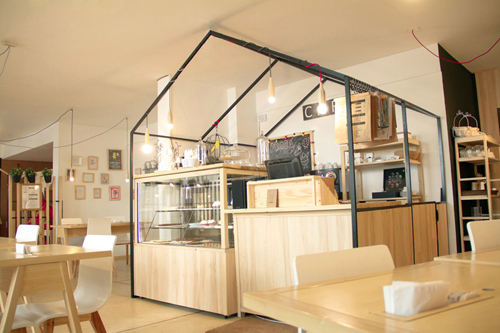 Parents to two children, Mariela Vergagni and Diego Cores envisaged a a cafe where children could have just as much fun as their parents. 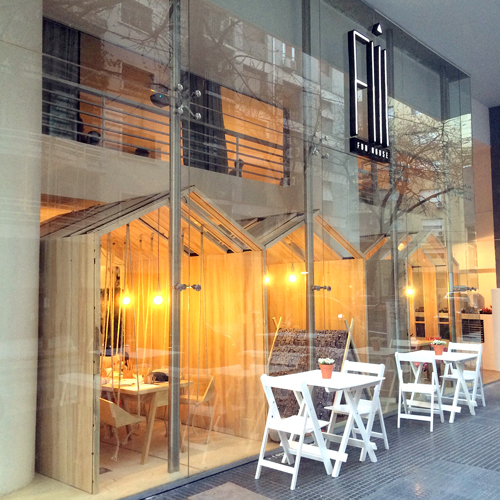 Seeking the help of architect Íris Cantante, they set out to see their idea take life. The result is Fii Fun House, a cafe downstairs and event space up. The design uses the idea of breaking down space with simple wooden hut shaped structures, vertical slat fencing and a wide variety of furniture. Swinging seats, fabric cushioned pods, bench seats and a children's playroom all work to provide choice for the customer user and ensure all are comfortable. 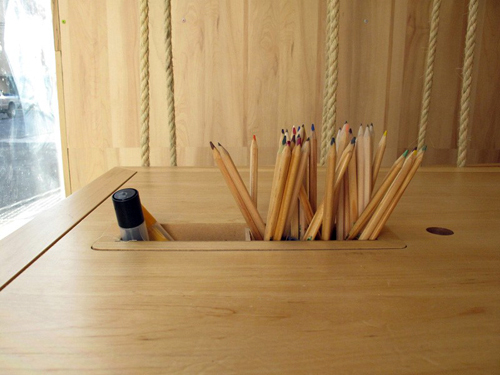 The tables even have pencil and crayon holders embedded in them for children (or adults too!) to use and express their creativity. All cool ideas for an EC centre or any space in fact that considers our youngest users. 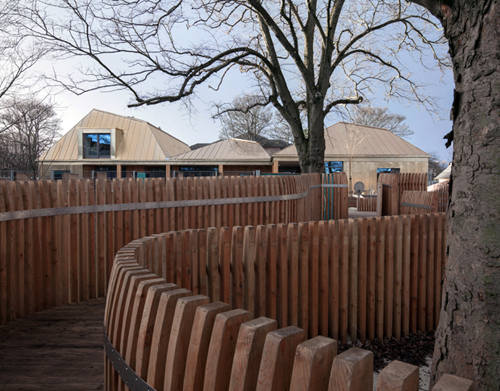 The Arcadia Nursery, a winner of the recently announced 2015 RIBA National Award has been praised for its design encouraging "free play". 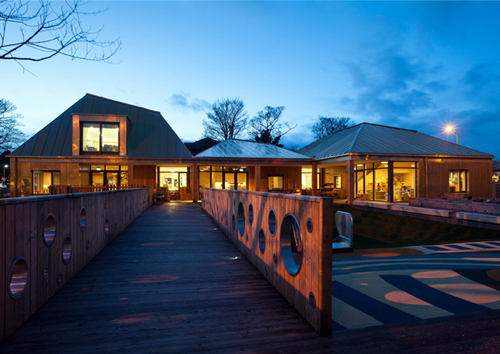 An approach that nurtures childrens' creativity and independence, allowing their confidence to grow. 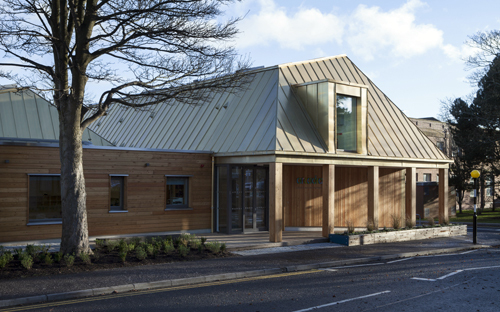 Designed by Malcolm Fraser Architects, the 110 (0-5 years) child capacity centre was designed to provide early education and care for children of The University of Edinburgh staff, students and wider public. 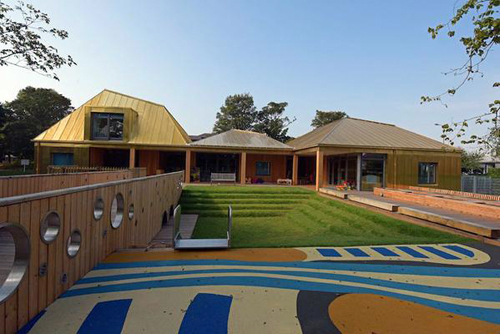 The architects worked with the site's existing nursery managers and identified a number of issues with the existing buildings. Namely disconnected spaces, a lack of connection to the outdoors, no opportunities for the children to come together in one space, difficultly settling children when changing age groups, and the financial strain of over-staffing due to small rooms and remote children’s WCs and baby change. 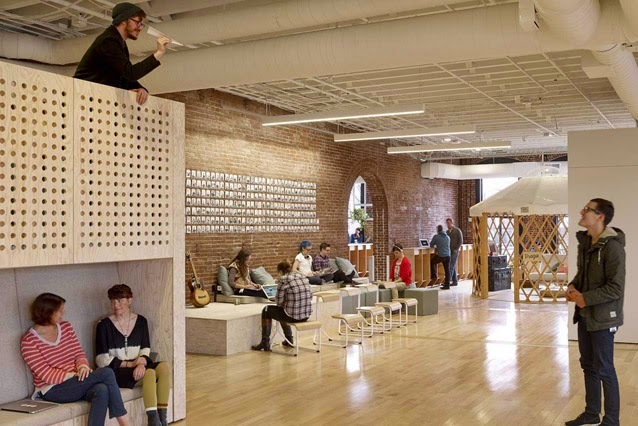 Above, a section showing the building's modest form yet varied size space including mezzanine (or loft) spaces. Their solution was to consider the new nursery as a free-flowing series of interconnected spaces that could be opened-up or closed-off to suit the activities of the day. The focus being not solely on one playroom per age group, but a series of additional spaces such as shared messy / art rooms, a children’s kitchen, raised cosy mezzanine spaces for quieter times, and a music and reading room, which are all connected at the heart of the building with a flexible welcome and circulation space, used for many functions including dining and coat storage. It is a simple form consisting of three playrooms each with access to a covered terrace and linked with a flexible central space. 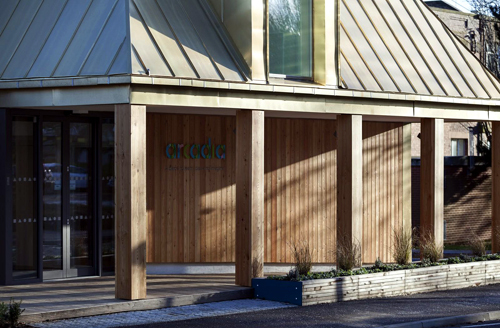 The cross-laminated timber structure provides the perfect combination of creating a warm, tactile interior whilst also using a natural, sustainable product that could structurally achieve the clear roof volumes catering to mezzanine spaces. Outdoor spaces are considered as another "playroom" for the nursery, and is thus treated with as much importance. The garden is divided into three distinct zones: The "enclosed" garden is directly accessed from the nursery building and allows the children to spill out form the playrooms. A covered terrace provides an intermediate space between the indoors and out and includes grass steps, a bubble bridge, stacking boxes, a water pump, raised vegetable planters, a slide, a climbing rope, stepping stones and a potting shed, all encouraging ‘open-ended’ creative play. 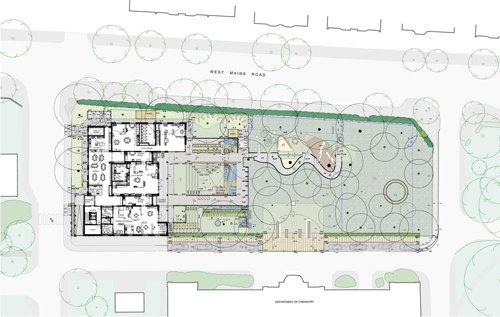 Above, a site plan showing the large amount of outdoor landscaped play space. The third zone is the wider (not enclosed) landscape accessed via a gate with a raised timber walkway (seen above) providing a journey through the trees. This takes the child to a more 'adventurous' playground entailing a rope bridge, climbable trees, log ladders, a sandpit, mounds and meadows where the grass is allowed to grow long and flowers, birds and bees are observed. 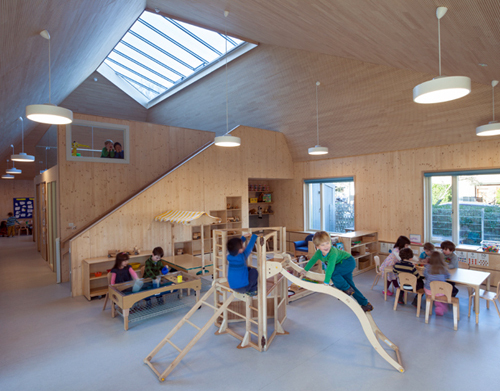 Careful consideration has also been paid to the child's health and well being with natural daylighting and ventilation, a minimal palette utilising mostly good quality natural materials and non-institutional hanging lights. All inducing a homely feel. Mezzanine spaces overlook the playrooms, while a skylight offers views to the sky and tree canopies above. 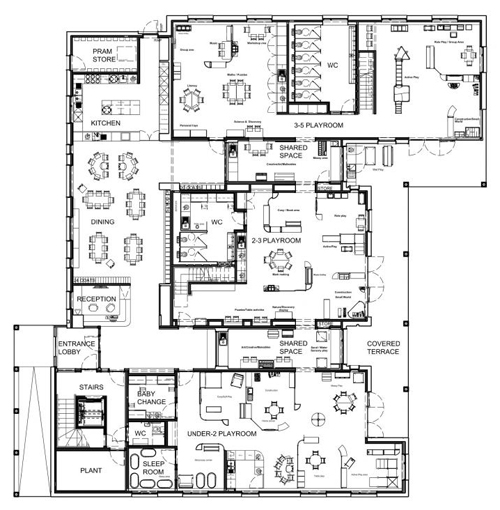 Above, the ground floor plan shows the mix of functional spaces being provided (i.e. 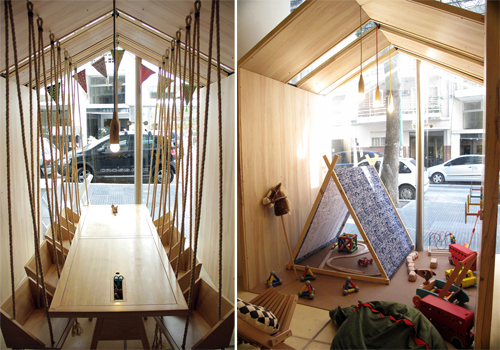 sleep room, baby change areas and pram storage) with interconnected flexible, shared play spaces offering freedom and choice to the child for their learning. The "free play" pedagogy is about encouraging children to choose which activities they would like to participate in or whether they would like to play inside or outside instead of the day being dictated to them. The Arcadia Nursery manages to realize this vision whilst ensuring the safety and well-being of the children it caters to. Showing at the The Architecture Gallery, RIBA (London) is this re-imagining or exploration of the Brutalist playground landscape of the now perceived as cold post-war housing estates. Commissioned by Assemble and artist Simon Terrill, the exhibition running till August 16th will portray elements of the Brutalist playground in life size form within the gallery space - forcing the viewer to look at the materiality and visual language of these bold "city renewal" architectural ambitions. Introductory video below... Looks interesting! The OB Kindergarten designed by Youji No Shiro and HIBINOSEKKEI (also designers of the very cool D.S. Nursery see post here) in Nagasaki, Japan responds to it's ocean-fronted, yet urban dense site with a form that both makes the most of it's blue view and lack of outdoor space for play with a rooftop playground. 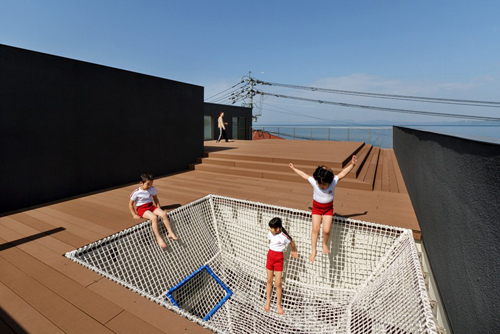 Seen below, a central feature of the kindergarten design is a rope loft that can only be accessed by the children having to climb up the rope-made tunnel to be greeted with a rooftop terrace facing the ocean. 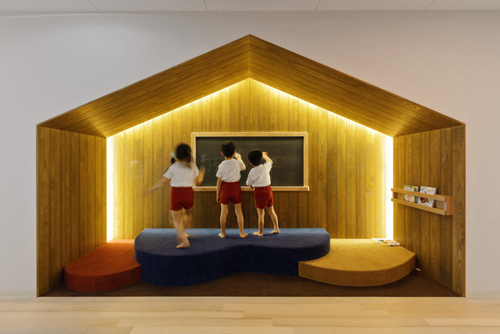 Blackboard walls, house-shaped hideouts and dens, varying types of lighting and materiality and texture makes for a creatively stimulating and physically fun place to explore one's capabilities and in which to grow a "challenging mind". A sunny indoor and outdoor terraced double-height glazed dining hall is a central coming-together point in which the children can share their all important meal times. The architects believe that art is also especially important and have provided "messy" spaces (along with the many blackboard walls) for this activity to occur. I'm well impressed with Youji No Shiro's continuing work in the area of EC architecture and look forward to seeing what more they come up with. In 1971, Josef Albers established a not-for-profit organisation The Josef & Anni Albers Foundation to further the "revelation and evocation of vision through art". Left is Josef, and right his wife Anni Albers, both leading pioneers of the abstract 'modernist' art movement in the 20th century. The foundation was to preserve and continue to promote the work of Josef and Anni Albers' aesthetic and philosophical principles in which they lived. Both among the leading pioneers of 20th century modernism, Josef was best known for his 'homages to the square' and for his innovative 1963 publication 'Interaction of Colour'; and Anni, a textile designer, weaver, writer and print-maker inspired a reconsideration of fabrics as art form. The couple met in 1922 at the Bauhaus Art School in Germany. 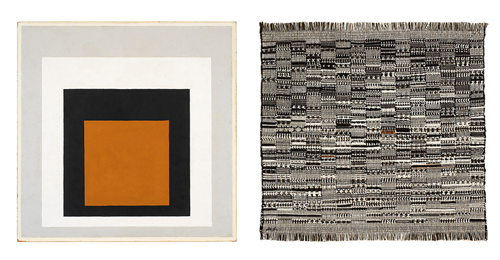 Left is Josef Albers' 'Homage to the Square'. Right is Anni Albers' cotton weaving 'Open Letter'. 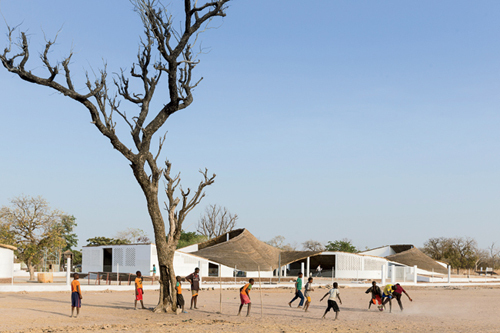 Both are clearly reflected in the new 'Thread' art & cultural centre in Senegal. 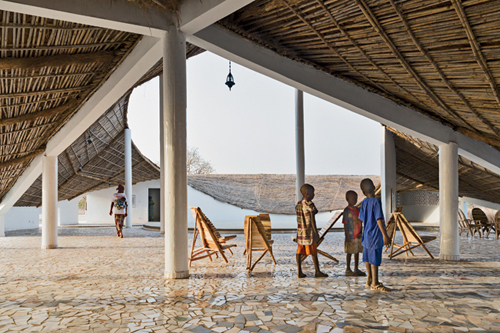 'Thread', a new artists' residence and cultural centre in a small village in remote Senegal, Africa was designed pro bono by New York architect Toshiko Mori and was initiated by the Albers Foundation is a living testament to the Albers' vision and aesthetic and philophical aspirations. On opening day this past March, more than 1,000 people from Sinthian and surrounding villages flocked to the center. In one of the light-filled courtyards, community members delivered hours of speeches, dances, rap music, and skits. The design cleverly responds to the hot and dry climate, as well as to taking into account the local and cultural traditions, labour and materials. 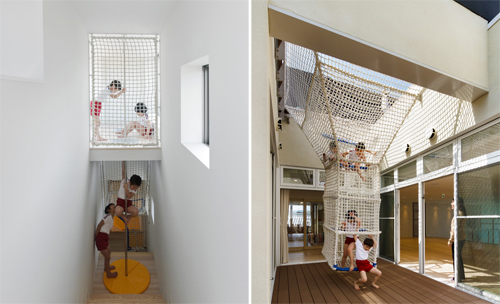 Flexible open space and courtyards provide ample room for children to use and play. Low-slung brick walls perforated in a geometric pattern resembling Josef Albers' work provides ventilation and light whilst keeping dust out. A parametrically undulating roof rests upon these solid walls, constructed of 3 layers of bamboo topped with thatch. The undulating roof is constructed by local workers with native bamboo and thatch. Community members contribute to the center’s maintenance. The sloping roof directs rainwater into canals which then drain into covered cisterns, allowing the water to be harvested. 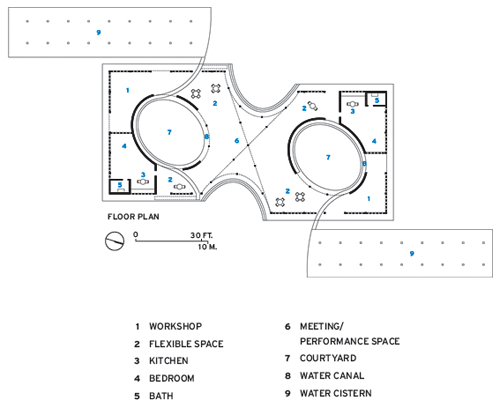 The figure eight plan accommodates two artists' residences in the north-west and south-east corners, while two circular courtyards serve as venues for performances and meetings. Open/flexible space allows further for any activity the community desires. The project successfully "threads" the local with international (and modern) abstract vision. 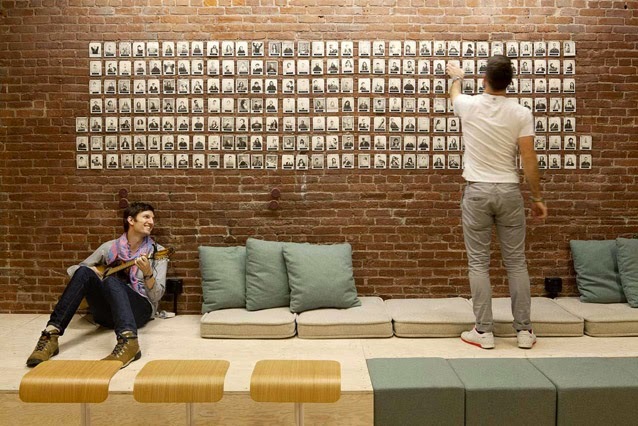 A testament to how architecture can both respond to concept and physical change. Are you an architect of a school, kindergarten or university? 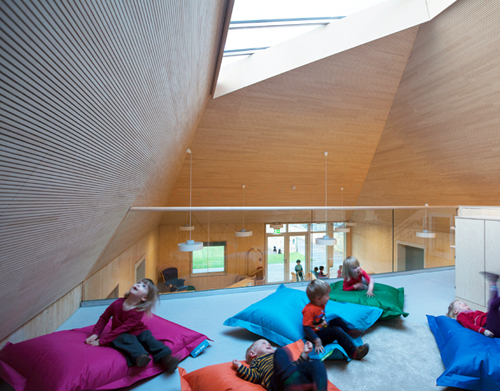 The Architectural Review is seeking the most exciting places of learning in the world - from kindergartens to universities, nurseries to high schools. Enter the AR Awards by August 7th for the chance to win a mini film to be made of your project, and to gain much international exposure. 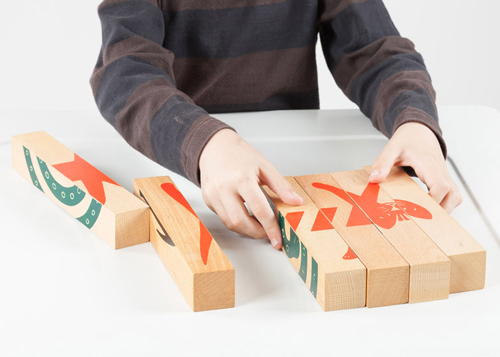 In the 1960s and '70s a number of designers began to re-think the kind of objects that children required to play (and thus learn) with. As Jean Piaget said, "play is the serious business of children". 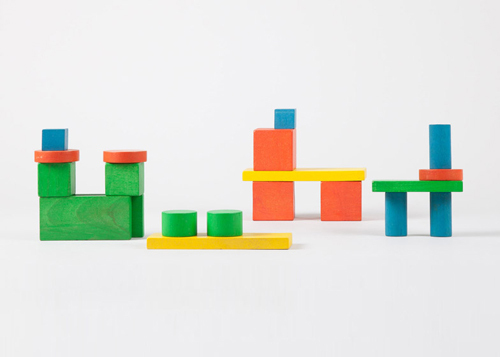 'Play: Toys, Sets, Rules' is brought about by London Studio Systems and brings together toys from the personal archives of their designers - a loosely associated group that emerged in London in the 1960s. 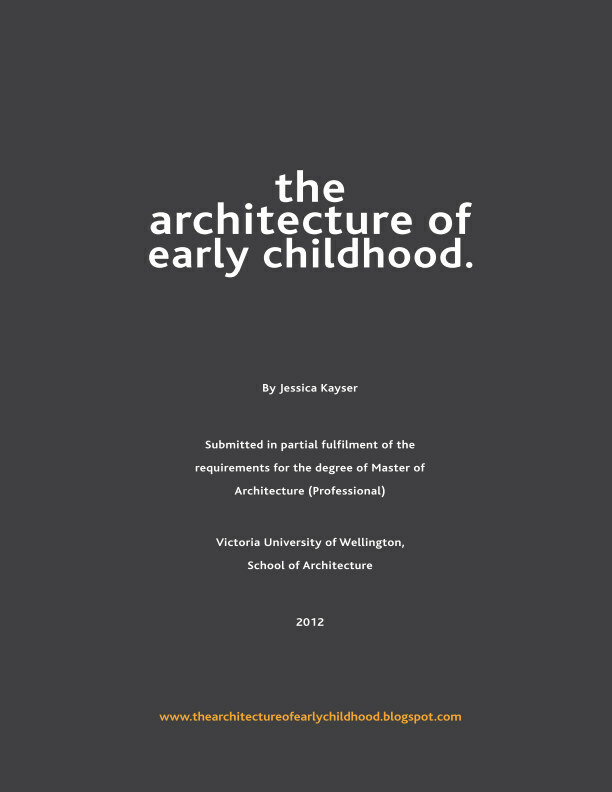 The exhibition, which is part of the 2015 London Festival of Architecture offers a unique survey of late modernist approaches to child development and design, and provokes a discussion around play as formulative and speculative activity. The play objects are indeed beautiful and finely crafted and could stand proudly displayed on a mantel piece in addition to offering curious interactment. 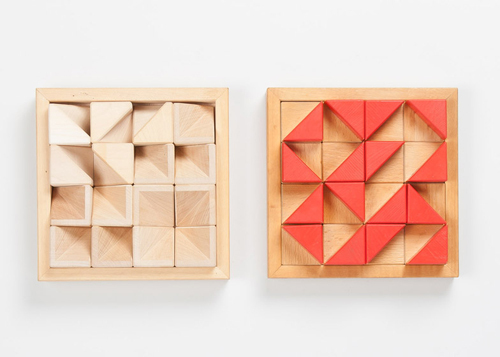 The various toys on exhibit include themes of modularity (with blocks and interslotting components) to build any imaginable structure, furniture, or machine; geometric puzzles - such as the cube tray and the Sechseck Legespeil and marbles. All featuring bold colours and natural materials. The toys are reminiscent of Froebels 'gifts' inducing both an appreciation of form and of creative thought in the curious child. If you're in London, go check it out! Via Dezeen and London Architecture Diary.